vacancies available in this Brihanmumbai Municipal Corporation BMC Recruitment Exam are 1388 posts. Interested candidates have to visit the official website of BMC Mumbai @mcgmLabourrecrutiment.mahaonline.gov.in and apply for BMC Labour, worker and other jobs. Application submission through online starts from 11-12-2017 to 31-12-2017. Candidate must have passed 10th class with Marathi as one of the subject. Selection for this BMC Labour, Worker vacancies is based on candidate merit skills in Online written exam. Exam Pattern and Syllabus details of BMC vacancies are given detailed in the notification. 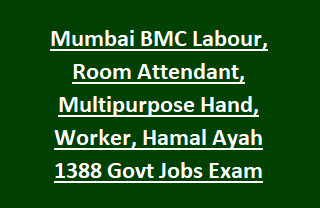 For more information regarding Brihanmumbai Municipal Corporation BMC Labour, worker, ayah, room attendant, Hamal vacancies Exam notification syllabus details, age limits, Pay Scale, application Procedure details are given below. Total available vacancies in this Mumbai BMC Labour Recruitment Exam Notification are given below. Total no of vacancies: 1388 posts. Name of the post: Labour, Hamal, Worker, Aayah, Room Attendant, Crematorium workers, Multipurpose Hand. Maximum age limit is 38 years for general category and for 43 years for reserved candidates. Candidate must have passed 10th class with Marathi language as one of the subject with 100 marks. Brihanmumbai Municipal Corporation selection committee is going to conduct Online written exam to select candidates for BMC Labour vacancies. Only Qualified candidates will be allowed for documents verification. BMC Online exam consists of 100 questions conducted in Marathi language only. The duration of exam is 2hours. Total marks are 100. Min qualifying marks for this Mumbai BMC Labour jobs exam is 50 marks. Interested candidates have to visit the official website of BMC Mumbai @mcgmLabourrecrutiment.mahaonline.gov.in. Candidates interested for BMC recruitment Labour, worker and other jobs have to send applications from 11-12-2017 to 31-12-2017 through online.